RNA polymerase II (RNAPII)–the enzyme that produces RNA from a DNA template–can become stuck due to damage to the DNA template, and these jams must be cleared to restore gene expression and normal cell function. 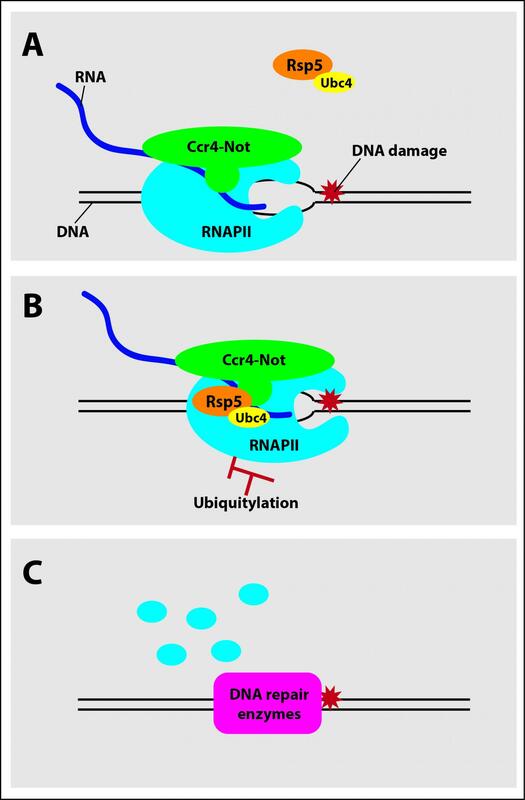 New research shows that the master regulatory complex, “Ccr4-Not,” performs this task, associating with RNAPII during the transcription of RNA from DNA and marking RNAPII for degradation when it becomes stuck, allowing the DNA to be repaired and normal cell function to resume. “Normal cellular functions rely on what is sometimes called the ‘central dogma of biology,'” said Joseph C. Reese, professor of biochemistry and molecular biology and member of the Center for Eukaryotic Gene Regulation at Penn State. “Genes in DNA are transcribed into RNA, which are in turn translated into proteins, which carry out the function of the cell. This is a highly orchestrated process and the precise control of gene expression and protein turnover determines cellular functions. During the transcription of RNA from DNA, RNAPII–itself a large complex made up of multiple protein subunits–travels along the strand of DNA reading the ATCG sequence and producing a complementary strand of RNA. If the RNAPII encounters DNA damage, which can be caused by UV radiation and other sources, it can become stuck and prevent trailing polymerases from completing transcription of the gene, similar to how a stalled car prevents traffic behind it from flowing. If this jam cannot be cleared, multiple RNAPIIs transcribing the same gene can start to pile up in a sort of traffic jam preventing the DNA from being repaired and hampering cell function. The researchers used genetic methods and reconstitution biochemistry–a method whereby purified components of a cellular process can be added, taken away, and mixed in a precisely controlled manner to identify exactly how they function–to show that Ccr4-Not recruits factors that mark RNAPII with a small signaling molecule called ubiquitin. Attachment of ubiquitin to RNAPII triggers other cellular components to degrade the enzyme, clearing the jam. In addition to Reese, the research team includes Haoyang Jiang, Marley Wolgast, and Laura M. Beebe at Penn State. The research was supported by the U.S. National Institutes of Health.